Have You Had Your Soul Pop Today? and buy Tootsie Pops. The caramel burst of flavor would last almost until we got back home, but then my favorite part would happen. 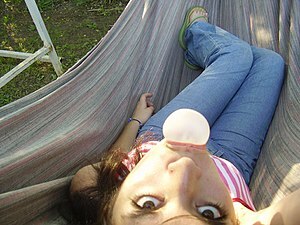 I would finally reach the best part – the bubble gum! That gum would be happily chewed for several more minutes, prolonging my enjoyment of this wonderful candy. In my mind, Tootsie Pops were the best idea ever. They were fun like a lollipop, lasted a long time and you were rewarded for your efforts! Have you ever thought about creativity in the same way? We are all creative in some way, whether it is visual (artist or painter), auditory (musician, speaker), gustotory (chief, caterer), movement (dance) or communication (writer, politician). You are unique in how you express your creativity Recognize that you create something new every moment you breathe. I don’t know about you, but I am happiest when I am “in the moment” and being creative. Time slips away, my thoughts are focused solely on what I am doing and no worries creep into my mind. It could be a minute or an hour, but it doesn’t matter how long I spend. The end result is always the same – I return from my creative place relaxed, fulfilled and happy. Call it a Soul Pop. I truly believe that the world would be a much happier place if everyone made sure they had their Soul Pop every day. Almost like a multi-vitamin for well-being and happiness, it is an essential ingredient to a happy and joyous life. Try it yourself and see if you don’t feel better. Just for today, take ten minutes to be creative. Buy some flowers and arrange them in a pretty vase. Pick up a pen and paper and draw something that captures your attention. Put on a favorite piece of music and let your body move to the beat. Listen to yourself and allow your Self to be expressed in the physical world of form. Stand out of your own way and see what happens! You will discover a spurt of energy and joy that you may not have felt in a long time. It may even inspire you to make this a daily practice. Follow your intuition and let your Self out to play.